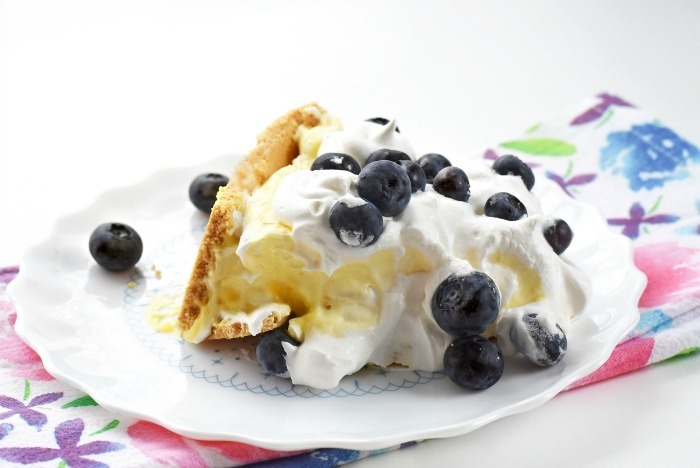 Blueberry Buttermilk Pie is a delicious no-bake dessert recipe that is made with graham cracker crust, instant vanilla pudding, and whipped topping. Perfect for warm weather parties, cookouts, and after dinner dessert. Now that the warmer weather is here, I am on an official no-bake desserts kick! I really do not feel like running my oven and have been trying to line of some chilled desserts that are easy to make and eat! 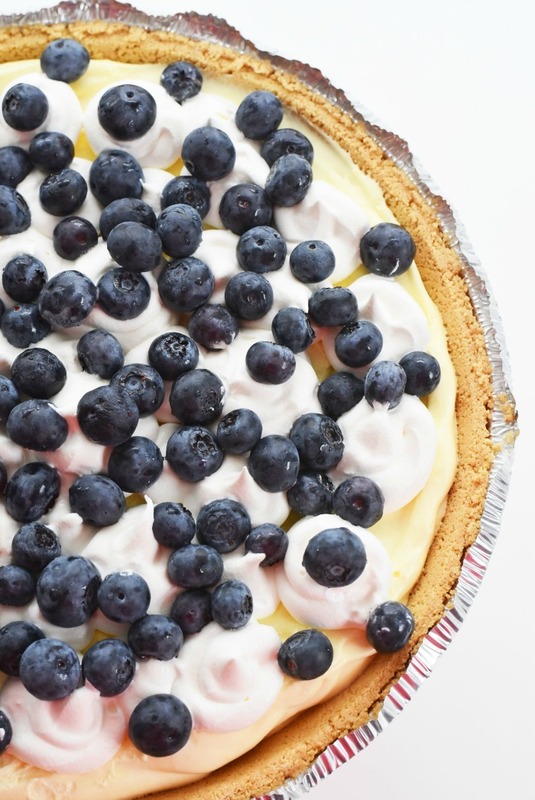 This No Bake Blueberry Buttermilk Pie is a delicious recipe that I found on the Kraft website. Since I am all about easy as pie desserts ((see where I was going there)) I thought this would be a nice touch to try out. For my version of Blueberry Buttermilk Pie, I mixed things up by adding a finishing touch of piped whipped topping. I love how it made the pie’s presentation prettier and it also tasted yummy. Blueberry Buttermilk pie is so quick to make but does take some time to set. 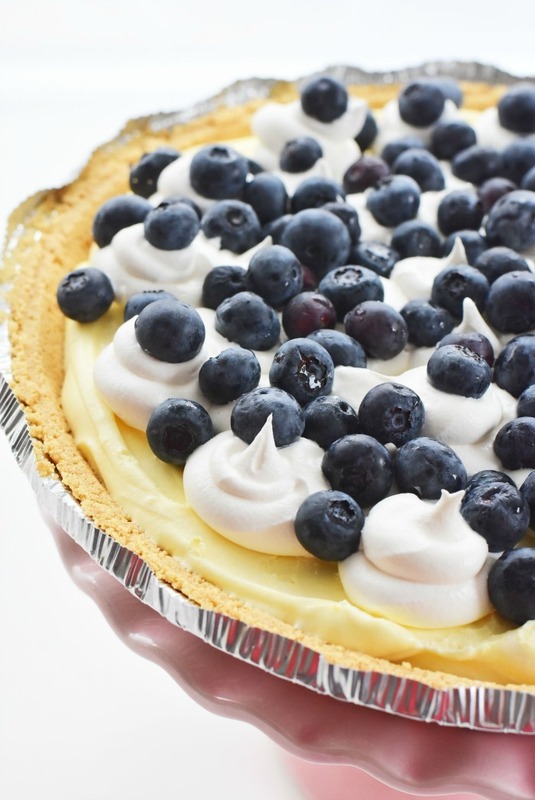 You can speed up the process by placing your pie in the freezer for 4-6 hours (with no blueberries added). Additionally you can increase the setting time to 24 hours for the neatest slice. I recommend allowing the pie to sit on the counter for at least 30 minutes after it has been removed from the freezer (if it is frozen solid). This will allow it to thaw before sprinkling it with fresh blueberries and serving. Although this recipe calls for buttermilk you may not have any on hand, or live near a store that sells it! That is ok because it is so easy to make your own buttermilk! Squeeze in either 2 tablespoons of vinegar or 2 tablespoons of fresh lemon juice. Allow milk to sit for about 5 minutes. The milk will start to curdle. This is the homemade buttermilk that will give your pie a nice zesty taste! In a medium bowl, whisk 2 cups of buttermilk and both boxes of vanilla pudding (2 minutes). Line one cup of pudding (it will be thick) on the bottom of the store-bought pie crust. I used a rubber spatula to evenly layer it. In the medium bowl with the pudding, add 1 cup of whipped topping and gently fold in. Using a rubber spatula, add the pudding and whipped topping mixture to the top of the pie. Carefully smooth it over. 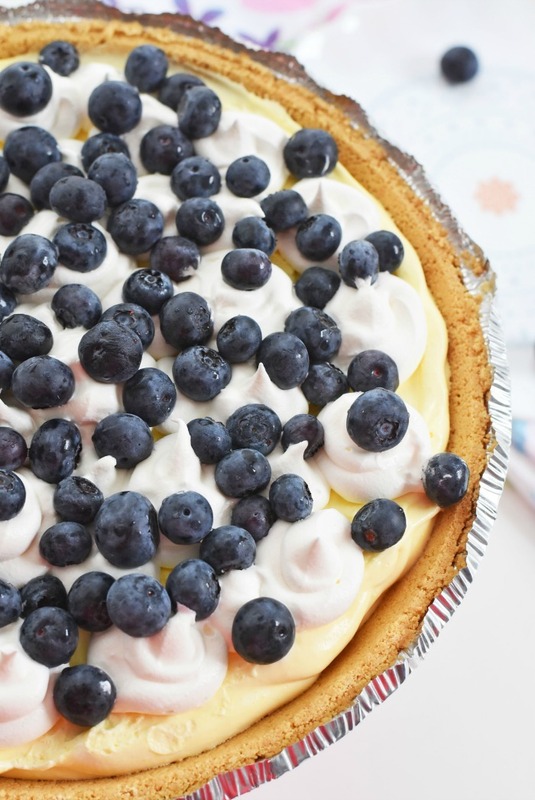 Top with additional whipped topping and blueberries right before serving. We were so eager to eat this pie that I just set mine in the fridge for 2 hours. This is why the slices were not picture perfect. They still cut fine but were a little messy, but oh, so tasty! 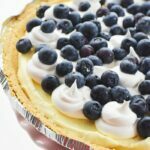 Blueberry Buttermilk Pie is a delicious no-bake pie recipe that is made with graham cracker crust, instant vanilla pudding, and whipped topping. 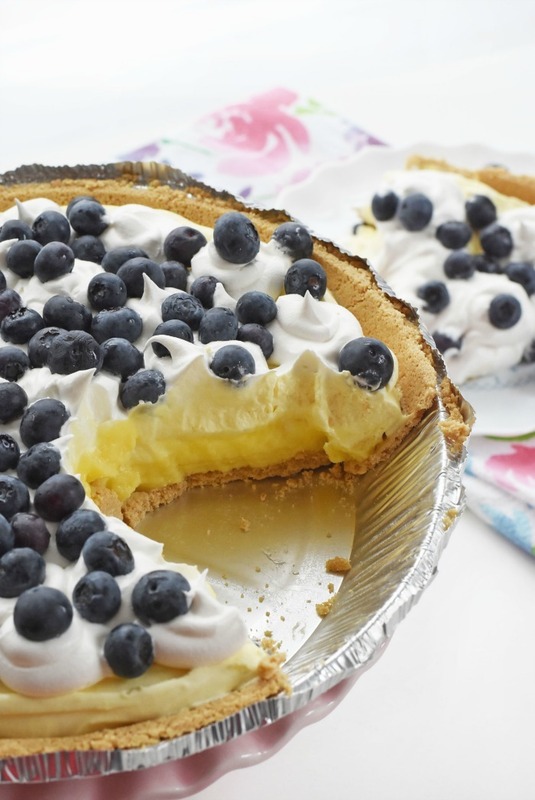 Perfect for warm weather parties, cookouts, and after dinner dessert. In a medium bowl, whisk buttermilk and both boxes of vanilla pudding (2 minutes). Line one cup of pudding (it will be thick) on the bottom of the pie crust. Refrigerate for 2 hours or longer. 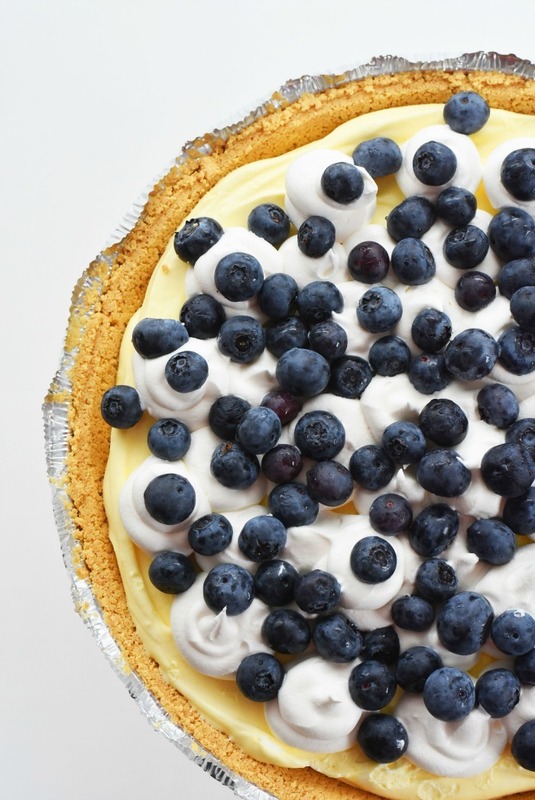 To get a neater slice, you can freeze pie for 3-4 hours. Previous Post: « Perfect No Bake Peanut Butter Cheesecake (With Oreo Crust)!